The Girl who runs Bite From The Past writes: Bonnie Wise, one of the organizers of the festival and a member of the Jane Austen Society of North America, was kind enough to answer a few questions for me via email-and to send me two recipes for afternoon tea. 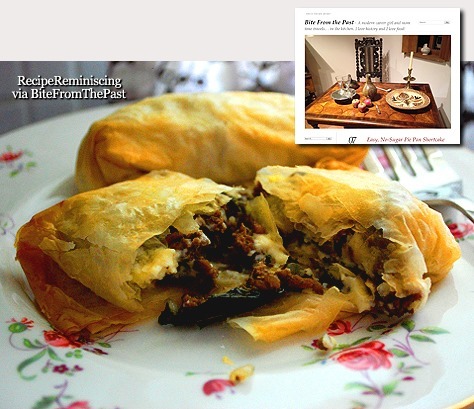 Bonnie said this recipe is based on one found in Victoria Magazine called TeaTime Bliss. 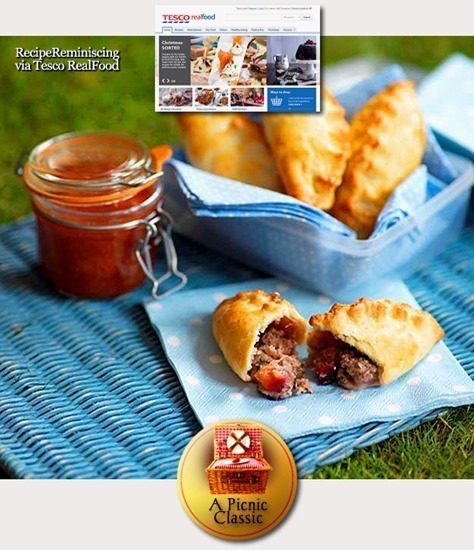 A traditional pasty recipe will invariably contain meat but a delicious alternative is a Crab and Prawn Pasty. 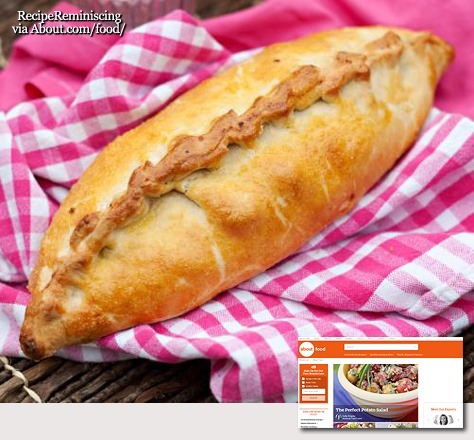 This pasty recipe is light yet very nutritious with such a lovely filling. Buy fresh crab meat when possible, if not, tinned white crab meat is also excellent. Roast boars and flagons of wine might be what most of us (at least fans of René Goscinny and Albert Uderzo like me) conjure up when we think of medieval cookery. But contemporary sources suggest that our ancestors enjoyed a wide variety of cuisine, and were adventurous in their tastes, too. 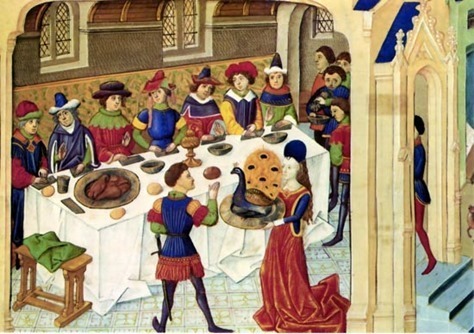 Here is an article where freelance writer George Dobbs reveals five examples of commonplace courtly dishes that wouldn’t look too out of place on your dinner table today. Sweet and sour rabbit is one of the more curious dishes included in Maggie Black’s The Medieval Cookbook. Found in a collection of 14th-century manuscripts called the Curye on Inglish, it includes sugar, red wine vinegar, currants, onions, ginger and cinnamon (along with plenty of “powdour of peper”) to produce a sticky sauce with more than a hint of the modern Chinese takeaway. The recipe probably dates as far back as the Norman Conquest, when the most surprising ingredient for Saxons would have been rabbit, only recently introduced to England from continental Europe. In the same manuscript we find instructions for pasta production, with fine flour used to “make therof thynne foyles as paper with a roller, drye it hard and seeth it in broth”. This was known as ‘losyns’, and a typical dish involved layering the pasta with cheese sauce to make another English favourite: lasagne. Sadly the lack of tomatoes meant there was no rich bolognese to go along with the béchamel, but it was still a much-loved dish, and was served at the end of meals to help soak up the large amount of alcohol you were expected to imbibe – much as an oily kebab might today. In Thomas Austin’s edition of Two Fifteenth Century Cookery Books, you can find several other pasta recipes, including ravioli and Lesenge Fries – a sugar and saffron doughnut, similar to the modern Italian feast day treats such as frappe or castagnole. The full edition, including hundreds of medieval recipes, can be found online through the University of Michigan database. Rice was grown in Europe as early as the 8th century by Spanish Moors. By the 15th century it was produced across Spain and Italy, and exported to all corners of Europe in vast quantities. The brilliant recipe resource www.medievalcookery.com shows the wide variety of ways in which rice was used, including three separate medieval references to a dish called blancmager. Rather than the pudding you might expect, blancmager was actually a soft rice dish, combining chicken or fish with sugar and spices. Due to its bland nature, it was possibly served to invalids as a restorative. There were also sweet rice dishes, including rice drinks and a dish called prymerose, which combined honey, almonds, primroses and rice flour to make a thick rice pudding. 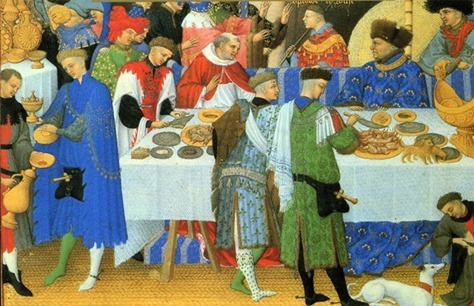 Wrapping food in pastry was commonplace in medieval times. It meant that meat could be baked in stone ovens without being burnt or tarnished by soot, while also forming a rich, thick gravy. Pie crusts were elaborately decorated to show off the status of the host, and diners would often discard it to get to the filling. However, there were also pastry dishes intended to be eaten as a whole. In The Goodman of Paris, translated into English by Eileen Power, we find a recipe for cheese and mushroom pasties, and we’re even given instruction on how to pick our ingredients, with “mushrooms of one night… small, red inside and closed at the top” being the most suitable. 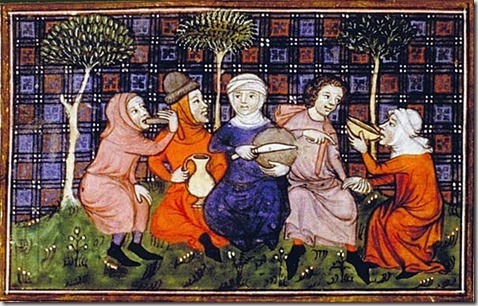 Subtleties are a famous medieval culinary feature. The term actually encompasses the notion of entertainment with food as well as elaborate savoury dishes, but it’s most often used to refer to lavish constructions of almond and sugar that were served at the end of the meal. These weren’t the only way to indulge a sweet tooth, however. Maggie Black describes a recipe in the Curye on Inglish that combines pine nuts with sugar, honey and breadcrumbs to give a chewy candy. 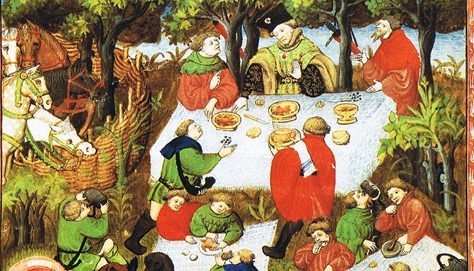 And long before it was a health food, almond milk was a commonplace drink at medieval tables. So what have we learned? From just a few examples it’s easy to see that, despite technological restrictions, cookery of this period wasn’t necessarily unskilled or unpalatable. It’s true that a cursory glance over recipe collections reveals odd dishes such as gruel and compost, which look about as appetising as their names suggest. But for every grim oddity there were many more meals that still sound mouthwatering today. 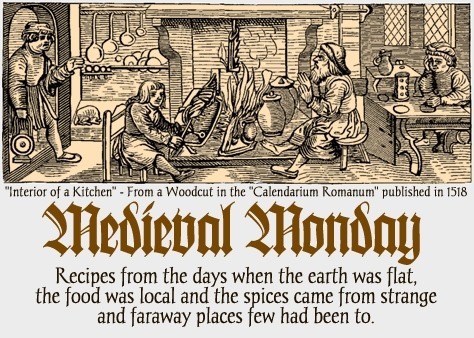 In fact, many of our modern favourites may have roots in medieval kitchens. who specialises in literature and history. 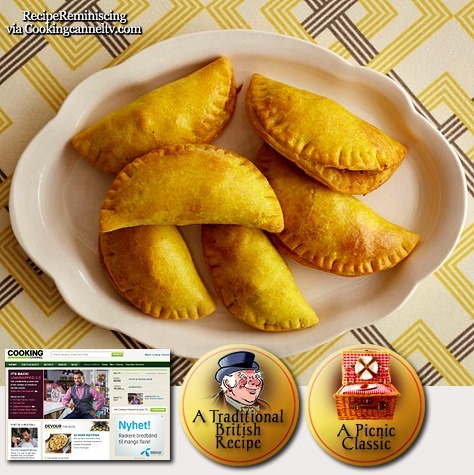 Reinvent the Cornish pasty — a crimped half-moon pastry filled with beef and root vegetables — by sourcing flavors found in Mexican empanadas and Indian samosas.